On June 04, 2018, DG ISPR Major General Asif Ghafoor held a press conference in which he praised national media for what he called playing a ‘positive role’ in the midst of challenges faced by the country and even challenged the anchors to openly talk about any censorship they might have encountered in their TV shows. However, in the same press conference, he lamented the role of social media where “anti-state” propaganda has been doing rounds, according to what he seemed to have gathered through their intelligence and monitoring. Major General Asif Ghafoor went on to show a slide containing images of prominent journalists and blank boxes saying that these are ‘political figures’ that allegedly, ‘retweet anti-state propaganda’ from their handles. DG ISPR warned that Inter-Services Intelligence (ISI) has the capacity to monitor social media activity. The showing of this slide by DG ISPR was seen widely as a threat by the military against Twitterati and freedom of expression in Pakistan and was widely criticised as open assault on freedom of expression. The Committee to Protect Journalists (CPJ), a New York-based organization working for freedom of Press, slated the remarks against journalists and equated it to putting a target on their backs. A day after the DG ISPR’s press conference, Ms. Gul Bukhari, a columnist in Daily Nation, regular talk show panellist at Waqt TV and a social media activist, was abducted in Lahore. Ms. Bukhari was known to be openly critical of the military’s role in politics on media and social media. She was released after being detained for several hours. Though the military denied any involvement in her abduction and expressed the need for an investigation of the incident, it is seen by many as a further warning to citizens and media to self-censor or bear dire consequences. 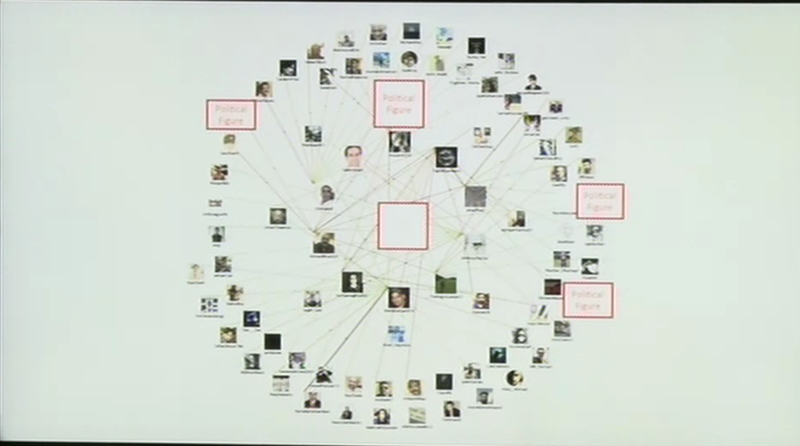 DGISPR showing a slide of social media accounts allegedly retweeting anti-state Tweets. On June 20, 2018, the daily newspaper DAWN reported that it was witnessing disruption in its distribution across the country. The management of one of the largest and oldest media house of the country released a statement citing harassment, physical coercion, and threats to their hawkers and distributors by officials posted in multiple towns and cities. The newspaper believes it to be a clear violation of Article 19 of the Constitution of Pakistan, which guarantees freedom of speech, etc. Activists, political leaders and international organizations have openly condemned this. PPPP leader Senator Raza Rabbani warned that holding free and fair elections would be next to impossible if this campaign of intimidation continues. ANP leader Mr. Afrasiab Khattak urged the judiciary, politicians and civil society to speak up on the matter of a prestigious daily newspaper being strangulated. Senator Mushahid Hussain Sayed tweeted that “Dawn, founded by Quaid-i-Azam Mohammad Ali Jinnah, a newspaper which was a vanguard of freedom movement, is now under pressure for not speaking the ‘officially certified truth’. Salute to its brave CEO Hameed Haroon and Editor for standing up for Article 19 of the Constitution.” In a statement PML-N spokesperson and former Federal Minister for Information, Ms. Maryam Aurangzeb said, “Free press is a fundamental pillar of mature democracies and civilised societies. The PML-N’s manifesto is firmly committed to independent journalism and freedom of expression.” PTI has not released a statement on the matter so far. PILDAT believes that Constitution as the law of the land is supreme and it guards freedom of the press ‘subject to any reasonable restrictions imposed by law…’. If the media is violating any legal restriction, there are legal and legitimate avenues available to hold them accountable. State institutions, no matter how powerful, can not and should not resort to illegal means to attack and muzzle media as they not only risk weakening public’s trust in them, but in the process cause irreparable damage to sustainability of democracy and prosperity of the State. Air Chief Marshal Mark Binskin, Chief of Defence Forces (CDF) Australia, called on COAS General Qamar Javed Bajwa, at the GHQ on June 5, 2018. They exchanged views on defence and security cooperation between the two countries. Australian Chief appreciated Pakistan Army’s efforts in the war on terror. United States Secretary of State Mike Pompeo telephoned the COAS at the GHQ on June 7, 2018. The two discussed the need for Political reconciliation in Afghanistan, targeting all militants equally and advancing Pak-US bilateral relationship. Mr. Bill Gates, renowned American businessman and co-chair of Bill and Melinda Gates Foundation, telephoned the COAS at the GHQ on June 7, 2018 and lauded his efforts for the eradication of Polio in the country. The COAS met Ambassador of Azerbaijan to Pakistan Mr. Alizada at GHQ on June 11, 2018. Mr. Alizada acknowledged Pakistan Army’s role in regional peace and stability and expressed the desire that his country aims to play a role in the regional peace. COAS visited Kabul, Afghanistan on June 12, 2018 on a daylong trip. During the visit, COAS had an exclusive one-on-one meeting with Afghanistan President Ashraf Ghani followed by delegations level discussions. He also met Chief Executive Abdullah Abdullah and Commander Resolute Support Mission John Nicholson. Foreign Secretary, Ms. Tehmina Janjua, Director General ISI, Lt. Gen. Naveed Mukhtar, Pakistan’s Ambassador in Kabul, and other senior officials accompanied him. They discussed regional security, Afghan reconciliation, border management, Afghan peace process and other issues of mutual interest. Chief of Army Staff General Qamar Javed Bajwa reaches Poland on official visit. 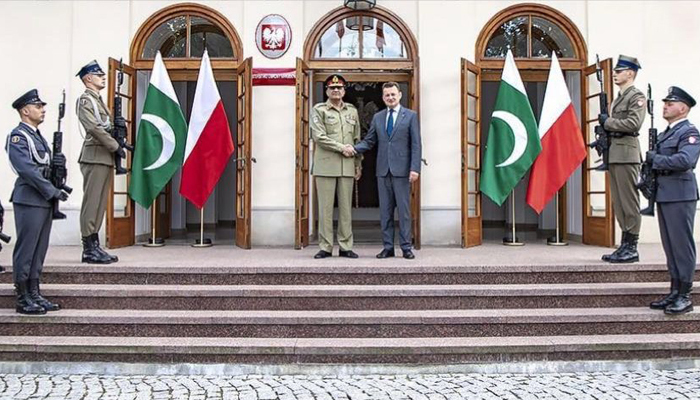 The COAS during his official visit to Poland met Mr. Mariusz Blaszczak, Minister of National Defence and Deputy Minister of National Defence on June 20, 2018. Emerging geo-strategic environment, regional security situation, and measures to further enhance bilateral defence cooperation were discussed in addition to matters of mutual interest. He had separate meetings with Polish military leadership. The Election Commission of Pakistan has notified that around 85,000 polling stations set up for General Election 2018 would be guarded by troops of Pakistan Army around the country. The army personnel will be present inside and outside the polling stations. Based on the number of polling stations, the media estimated that about 350,000 to 400,000 troops would be deployed compared to 85,000 troops deployed during 2013 polls when law and order situation was much more precarious. Army, at that time, had adopted a strategy of deploying troops at a central location to be available on call for a number of polling stations. This allowed Army to manage the security responsibility with much smaller number of troops without negative fallout associated with greater visibility of troops. It is reported that approximately 20,000 CCTV cameras would be placed at sensitive polling stations to aid them.. The ECP has also prepared a code of conduct with clear Do’s and Don’t’s for the security personnel. In addition, Pakistan Army will provide security to the printing press where ballot papers will be printed till their transportation (through Army helicopters, where required) to polling stations. Justice Shaukat Aziz Siddiqui of the Islamabad High Court, while hearing a petition against the encroachment of public land, directed the Inter Services Intelligence (ISI) to lift their blockade of a road adjacent to their office in Islamabad in one week. These blockades were placed by the ISI a few years ago after increased threats to sensitive government buildings. The court directed the ISI to take all security measures insides its territory. Deputy Attorney General sought time to schedule the clearance of road in question. Justice Siddiqui accepted the request and directed Defence Minister and DG ISI to appear before the court in person on July 4, 2018. Chief Justice of Pakistan, Justice Mian Saqib Nisar, summoned the heads of ISI, MI, DG Rangers (Sindh) and Inspector General of Police (Sindh) in the Missing Persons’ case. The move came when scores of relatives of missing persons met the CJP during his visit to lower courts in Karachi. Security officials appeared before CJP in his chambers the next day. While hearing complaints from hundreds of relatives of missing persons who had gathered in this court, the CJP ordered setting up special cells on missing persons. The ISPR reported that during the month of June, Pakistan Army engaged in following public relations activities. The 29 Baloch Regiment of Pakistan Army arranged an Iftar party for the tribesmen of Charmong tribes in Bajaur Agency on May 31, 2018. Around 200 youth aged between 15-21 years, who were imparted various technical skills, were also given certificates on the occasion. The 29 Baloch Regiment had trained these youth to enable them to earn livelihood for their families. Ramazan packages and Eidi were also distributed among 200 deserving persons on the occasion and tool kits were distributed among the youth for completing their training. Later, they inaugurated a middle school and martyrs monument constructed by the 29 Baloch Regiment in Charmong. Pakistan Army welcomed the return of the first batch of Internally Displaced Persons (IDPs) to Parachinar, Tribal district Kurram on June 20, 2018. Brigadier Akhtar Aleem, commander 73 brigade, and Deputy Commissioner Baseer Khan handed over keys to the returning IDPs for their new homes. Earlier, the returning IDPs upon entering Bab-e-Kurram were warmly received amid sounds of pipe band, drums, and traditional dance, by officials, tribal notables and political leaders of the area. They were offered garlands and taken to their new homes in a procession. The 211th Corps Commanders’ Conference was held at GHQ on June 27, 2018, chaired by the COAS. The forum expressed its commitment to the performance of Army’s mandated duties to conduct transparent elections in the country. “The COAS directed that this national duty be performed with utmost responsibility and without losing any focus on defence and internal security challenges,” said the ISPR. The forum reviewed geo-strategic environment and other developments in the region. Operation Radd ul Fasaad and socio-economic uplift in cleared areas also came under consideration with a commitment to achieve long-lasting peace and stability. Caretaker Prime Minister Justice (Retd.) Nasir-ul-Mulk chaired the 25th meeting of the National Security Committee at Prime Minister’s House on June 08, 2018. The meeting was attended by Mr. Abdullah Hussain Haroon, Caretaker Minister for Defence/Foreign Affairs, Ms. Shamshad Akhtar, Caretaker Minister for Finance, Mr. Muhammad Azam Khan, Caretaker Minister for Interior, Syed Ali Zafar, Caretaker Minister for Law/Information, Chairman Joint Chiefs of Staff Committee General Zubair Mahmood Hayat, Chief of Army Staff General Qamar Javed Bajwa, Chief of Naval Staff Admiral Zafar Mahmood Abbasi, Chief of Air Staff Air Chief Marshal Mujahid Anwar Khan, National Security Advisor Lt. Gen (R) Nasser Khan Janjua, Director General ISI Lt. Gen Naveed Mukhtar and senior civil and military officials. The meeting discussed overall security situation of the country, Prime Minister’s telephonic interaction with US Vice President Mike Pence and Pakistan’s progress on adopting regulations recommended by Financial Action Task Force (FATF), an international anti-money laundering and anti-terrorist financing watchdog. The committee expressed its satisfaction with Pakistan’s compliance with the required regulations. Later, during the FATF meeting in Paris on June 27, 2018, Pakistan was placed on FATF grey-list. Later in the month, National Security Adviser, Lt Gen (Rtd.) Nasser Janjua, resigned from the post on June 27, 2018, allegedly due to differences with the Caretaker Government, as reported by the media. Chief of Army Staff General Qamar Javed Bajwa calls on Caretaker Prime Minister Justice (Retd) Nasir ul Mulk at the Prime Minister’s Office. 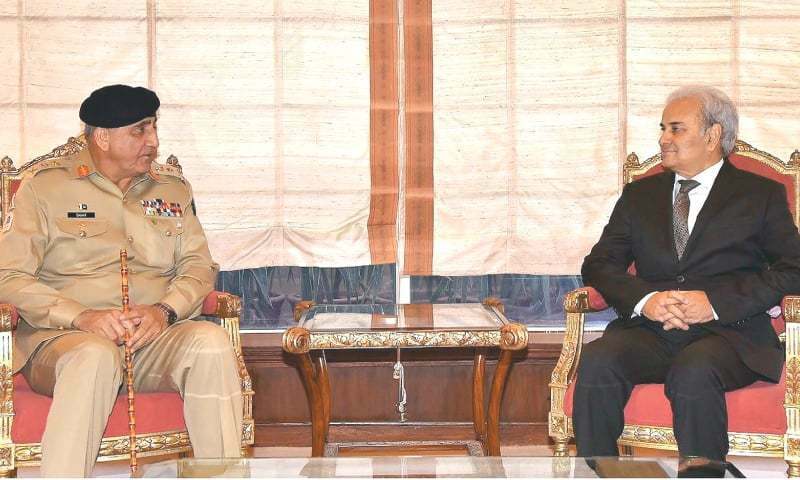 Caretaker Prime Minister Justice (Retd) Nasir ul Mulk and COAS General Qamar Javed Bajwa interacted twice in June 2018. Prime Minister Justice (Retd) Nasir-ul-Mulk chaired the 25th meeting of the National Security Committee at Prime Minister’s House on June 08, 2018 where the COAS was also in attendance. The COAS called on Caretaker Prime Minister Justice (Retd) Nasir-ul-Mulk at Prime Minister’s Office on June 25, 2018. No details of the meeting were provided to the media. Turkish courts have so far handed jail terms to more than 2,000 suspects over the failed 2016 coup aimed at unseating President Recep Tayyip Erdogan, a Turkish government Minister said on June 07, 2018. “Out of 287 court cases, 171 have been decided: 2,140 defendants have been given jail terms, and 1,478 of them have been acquitted,” Justice Minister Abdulhamit Gul told state news agency Anadolu. 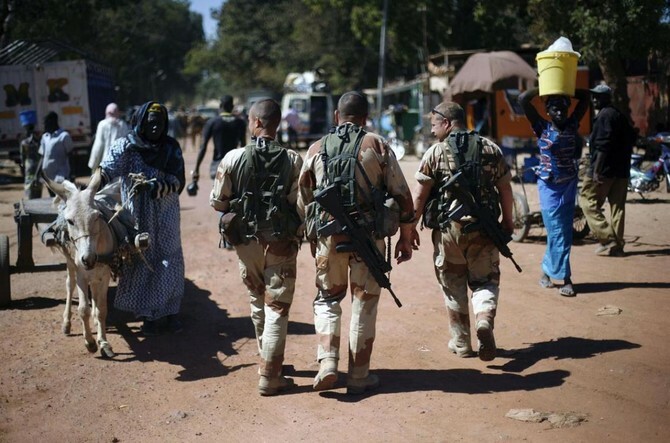 French troops patrol in Niono, Mali. Kisal NGO said 25 bodies had been found in three mass graves in central Mali. Twenty-five bodies were found in central Mali after its army carried out a sweep in the unstable region on June 18, 2018. The grim discovery was made after 25 people from the Fulani ethnic group, who are predominantly herders, were picked up last week by the army in the localities of Kobaka and Nantaka, said Kisal an NGO, working for human rights in the region. The Mali armed forces are facing increasing accusations of arbitrary arrests and extra-judicial killings in their fight against the insurgents.